As part of the international Hi-Wi project the University of Cambridge is investigating novel manufacturing processes for rare earth permanent magnetic materials that will facilitate the production of new classes of magnets with enhanced magnetic properties, reduced rare earth consumption or better mechanical properties. The Hi-Wi project is a European commission FP7 funded international collaboration between the University of Cambridge, University of Sheffield, Centro Ricerche Fiat, STMicroelectronics, Istituto P.M., CEDRAT Group and Siemens AG with the goal of producing the next generation of motors for electric vehicles as part of the European green cars initiative. 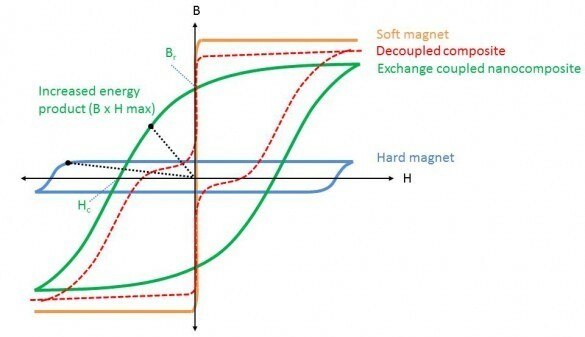 Shortly after the discovery of the Nd2Fe14B phase and its impressive hard magnetic characteristics (high coercivity and remenance) the nanocomposite exchange coupled magnet was proposed by Kneller and Hawig. The principle was that the exchange interaction, a quantum interaction which produces ferromagnetic alignment of neighboring dipoles, could be extended from one highly coercive hard phase a small distance into a less coercive soft phase. The exchange coupling of a hard phase and a soft phase can therefore pin soft phase dipoles, lending them the high coercivity (Hc) of the hard phase. 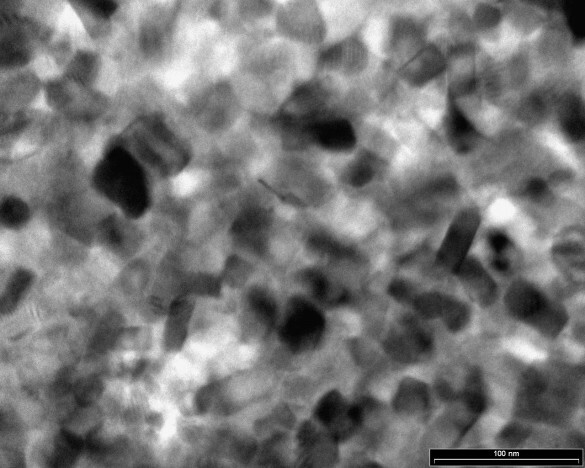 As soft phases such as Fe and Fe3B have much higher saturation magnetization (Ms) than hard phases like Nd2Fe14B nanocomposites of the two can have a higher remenance (Br) than Nd2Fe14B alone with only a slight reduction in coercivity. Schematic of BH loops for a soft, had, decoupled and exchange coupled magnetic material. The range of the exchange coupling interaction is however only ~10 nm so incredibly fine grained structures are required to achieve this effect. One approach being investigated at the centre for industrial photonics is laser annealing from amorphous precursors (produced by either gas atomization or melt spinning). The rapid heat treatment enabled by laser annealing can produce very fine grained nanostructures like the sample shown in the above TEM cross-section. The over reaching goal of this project is to apply the laser annealing process to a layer by layer production methodology for bulk magnets. A large consideration in electric motor design is the mechanical properties of the permanent magnets and their bonding to the motor. Nd2Fe14B magnets are inherently very brittle and prone to breaking. The inability to weld them to motor parts also leads to limited bond strengths from glues etc. These mechanical considerations lead to a limit on RPM . In an effort to produce mechanically stronger magnets for high speed motors the centre for industrial photonics is investigating the cold spray of mixtures of Al and Nd2Fe14B powders. The strong metallurgical bonds formed during the deposition of the composite onto the aluminum substrate are unprecedented in magnet manufacture. The central application envisaged for bulk nanocomposite manufacture are to reduce the consumption of rare earth elements in electric vehicle manufacture while still allowing the use of the very efficient brushless DC electric motor design. 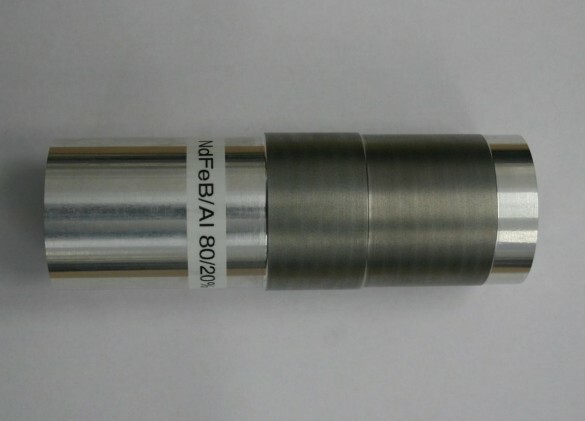 However magnetic meta materials such as exchange coupled nanocomposite magnets are also the only visible route to further improvements in the maximum achievable energy product so their future applications may also lie in producing more efficient motors or in use in any of the plethora of other applications rare earth magnets are currently used in. Cold sprayed micro composites of NdFeB and binders like Al will have application where enhanced mechanical properties are required such as high speed motors.